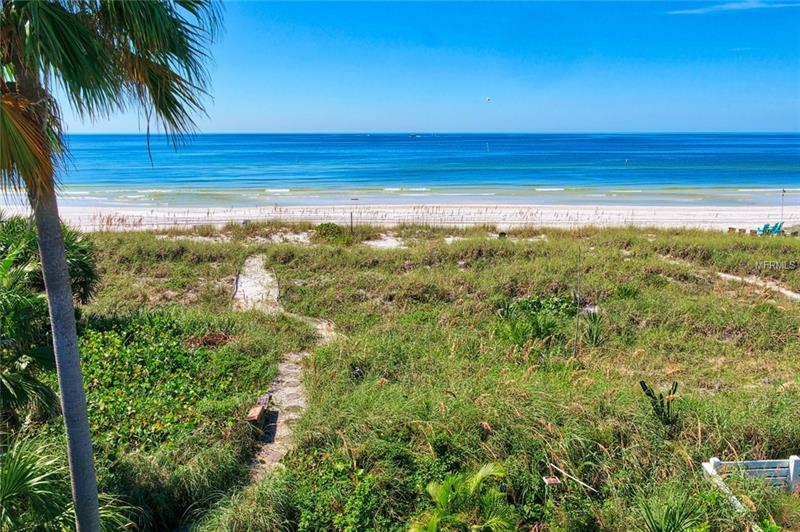 Incomparable Pass-a-Grille - Tampa Bayâs most coveted beach. Prime Gulf Front location. Quintessential Florida home. Sturdily built with an appealing durable Cypress wood exterior. Once thru the front gate - a private world of color, garden entry ways, alcoves, French and sliding glass doors, a butter fly garden, and lots of light and decks all leading to the one of the best beaches and sunsets in urban America. Well maintained home. Shows immaculately. Living area includes dining with a combined view of dunes and Gulf. First floor bedroom can also serve as office. Second floor ownerâs suite has a separate den/office in addition to main bedroom - with access to a sunny deck for morning coffee and views. Spacious guest suite. Closets/ storage abound. Oversized garage with work shop. Potting nook. Outside beach bath. Large front parking pad that can accommodate seven cars - - a rare find in Pass-a-Grille. Walking distance to historic 8th Avenue, restaurants and shops, the Yacht Club, and Don CeSar or by golf cart. Quick to 1-275, downtown St. Petersburg, and airports.